Before looking at the scientific evidence that Radin believes clearly supports belief in psi, we should consider his views regarding controlled experiments in psi. He writes: “If it can be shown that information really does get from one person to another, even after we control for the effects of belief, motivation, memory, and sensory input, then we know that in some of the case studies what seemed to be telepathy may actually have been telepathy” (p. 62). First, note the weakness of the statement: some cases may be telepathy. Actually, we know that before doing any studies and before setting any controls. (Despite what Radin thinks, most skeptics do not think psi is impossible.) On the other hand, Radin puts his finger on some essential elements of psi testing. We must have strong evidence of information transfer. This means we must do two things. 1. We must have clear criteria for measuring information transfer, so that we can be sure we are not measuring something else. This requires that we have clear criteria that identifies before we do the experiment exactly what information is going to be transferred. If we can’t do that, we must at least make sure that our criteria are not so loose as to allow a wide variety of events to be retrofitted and count as information transfer. 2. We have to control for other factors besides telepathy that might account for information transfer, so that if we do have measurable information transfer we will be confident that something besides telepathy is not responsible for the transfer. However, even if we are confident that our controls eliminate such things as cheating, memory, pure lucky guess, belief, motivation, etc., how can we be sure that the only reasonable explanation is that what appears to be a genuine transfer of information is in fact genuine and how can we be sure that some other factor that we have not controlled for, either because we didn’t think of it or because we couldn’t think of it, is not responsible for the information transfer? In short, it doesn’t logically follow that the transfer is likely due to telepathy simply because it is not likely due to sensory input, etc. As James Alcock points out, for all we know Zeus might be responsible for the transfer of information. Thus, even if information transfer is real, it is always possible that the transfer has nothing to do with telepathy. It may have nothing to do with Zeus, either. For all we know, the information may be coming from spirits who are tired of giving clipped messages to Jon Edward, Sylvia Browne, or James Van Praagh. It is also possible that it has to do with something naturalistic that has not been accounted for. In other words, even if the latest psi experiments are done with excellent controls and the resulting data are unlikely due to chance, it begs the question to assume they are probably due to telepathy. Some readers might find it interesting that when going through the early history of psi experiments, Radin ignores S. G. Soal’s studies but considers Upton Sinclair’s informal studies with his wife as good work that had been validated by Dr. Walter Franklin Prince of the Boston Society for Psychical Research in the 1930s. Radin does mention that even the pioneer J. B. Rhine—not one of the more careful psi investigators—recognized that maybe he wasn’t measuring telepathy when he got non-chance results. However, Rhine’s main alternative explanation was that maybe he was measuring clairvoyance. Rhine never considered the Zeus or malicious spirit hypothesis. Radin comments: “To the present day, no one has come up with a persuasive experimental design that can unambiguously distinguish between telepathy and clairvoyance” (p. 69). Radin also speaks highly of the dream telepathy experiments at Maimonides Medical Center by Montague Ullman and Stanley Krippner. (For a skeptical critique of these experiments see Hansel 1989.) Radin mentions none of the skeptical critique, which includes data on attempts at replication that failed because controls got tougher. I am not going to evaluate Radin’s meta-analysis of some 450 dream studies. I agree, however, with Radin’s comment on these studies: “All we know from the present overview is that chance can be soundly rejected as one of many possible explanations for the results observed in these studies” (p. 73). He is quite right to note that there may be “file-drawer problems” (studies with negative results not getting reported), varying quality in the individual studies, and problems with replication. But Radin is not bothered by the vagueness inherent in the criteria for evaluating information transfer in these studies. The best of the scientific studies are the ganzfeld (G. whole field or total field) telepathy experiments conducted by Charles Honorton, William Braud, and Adrian Parker. These experiments begin with the assumption that certain mental states are more conducive to psi. In particular, these researchers maintained that the meditative state, the dream state, the hypnagogic state, the hypnotic state, a sensory deprivation state, and certain drug-induced states are conducive to psi. These states, they claimed, have in common “reduced sensory input.” It is thought that the mind in these states is alert and receptive. However, according to Sue Blackmore, it has never been proven that certain mental states are more conducive to psi (Blackmore 2003: p. 302), much less that psi is real. Also, not all parapsychologists agree with this assumption. Freeman J. Dyson believes that paranormal events occur only when people are under stress and experiencing strong emotions. Robert Jahn believes that psi is irreplicable because it is “sensitive to a variety of psychological and environmental factors that are difficult to specify, let alone control.” J. G. Pratt thinks psi is a spontaneous occurrence in nature and that “predictable repeatability is unattainable.” Then, there is the shyness effect: if the investigator is overly skeptical or otherwise betrays distrust of the alleged psychic, this could adversely affect the paranormal performance (see Hyman 1989: 95). Radin seems to believe that the filtering of sensory data that is a function of ordinary consciousness may also be filtering out extrasensory data. But the most interesting thing about the ganzfeld experiments is that a skeptic (Ray Hyman 1989: 20-75) had input into the protocols used in the later studies. As Radin notes: “Most of the ganzfeld experiments took advantage of lessons learned in past psi research, thereby avoiding many of the design problems discovered by early experimenters” (Radin: p. 74). What Radin doesn't note is that if the researchers had not listened to their skeptical critics, the studies would most likely have continued to be done without regard for some essential safeguards. A meta-analysis of 28 studies was done, 23 of which had resulted in greater than chance hit rates, and the results were, according to Radin, “odds against chance of ten billion to one.” A further analysis by Honorton recalculated the odds against chance as being 10,000 to one, with replication in eight other labs besides Honorton’s own. Further analysis eliminated the file-drawer effect as a relevant issue. No obvious fatal design flaws could be found by skeptics, though Hyman took issue with some of the randomization procedures. However, after Honorton and Bem published their findings, Susan Blackmore visited one of the labs and found disturbing evidence that the studies were not as pristine as they appeared to be. (See next paragraph for details.) Radin claims that the hit rate of 37% for 25 studies (when 25% was expected by chance) corresponds to odds against chance of about a trillion to one (p. 84). How he arrived at this astounding number is his little secret. In any case, the integrity of the data has been called into question. Radin has once again exaggerated the quality of a field of psi research. We can be confident that when ganzfeld studies are done receivers are likely to guess correctly a one-in-four target in the long run at significantly greater than chance odds. It is still a leap to assume that information has been transferred and that the transfer was done by paranormal means. To say that you can’t think of any other explanation for the data and that a skeptic can’t provide a naturalistic explanation for it does not justify high confidence that telepathy has been established. 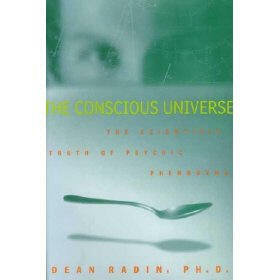 Nevertheless, it cannot be denied that, as Radin puts it “something interesting was going on” (p. 79). But is it telepathy or clairvoyance? I don’t know. Is it Zeus or malicious spirits annoyed with a Jon Edward performance? I doubt it, but I also doubt it is telepathy or clairvoyance. However, my doubts are irrelevant as to what is really going on. The best we can say is that we do not know why some subjects appear to perceive targets at a non-random rate. It might be worthwhile to study such subjects, not to see if they can transfer information, though we could do that, but we already know the results would show no transfer of information. We know this because if it were possible for anyone to transfer information telepathically in an unambiguous manner, it would already have been done. Why can none of the subjects who produce non-random results in ganzfeld experiments tell anyone what he or she is thinking at any given moment? The usual response is that the telepathic response is very weak or is being interfered with by so many other communications that it can’t function unambiguously.…yet. It has been suggested that it might be better to study the guessing behavior of successful subjects. Instead of studying extrasensory perception we could study the "Effect of Subjective Probability" (Brugger and Taylor in Alcock et al. 2003: 221ff.). We might also study more closely the laboratory conditions and protocols actually employed during psi experiments. This suggestion seems even more pertinent as we consider the next best scientific evidence for the existence of psi: Robert Jahn’s experiments with people trying to use their minds to affect the random output of various electronic or mechanical devices. Hyman, Ray. 1989. The Elusive Quarry: a Scientific Appraisal of Psychical Research, Prometheus Books.